The dangerous underfunding of US infrastructure was underscored by a fatal train derailment on May 12th. 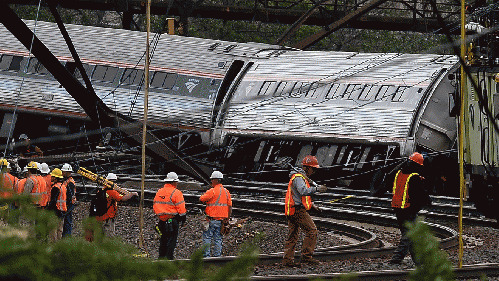 The tragedy did not deter the House Appropriations Committee from voting to slash Amtrak funding the very next day. There are ways Congress could fund its massive infrastructure bill without raising taxes. But the conservative-controlled Congress seems to have other plans for the nation's profitable public assets. The May 12th train derailment near Philadelphia, which killed eight people and hospitalized 200, was the deadliest Amtrak accident in recent history. The train barreled around a dangerous bend at 106 mph, more than double the 50 mph speed limit for the curve. Whether this was due to operator error or mechanical issues is not yet known. But experts say the derailment might have been averted by a safety system called positive train control, which can automatically reduce the speed of a train that is going too fast. The system must be installed on both the train and the route. The Amtrak train had it, but on that stretch of track in that direction it was not yet operational. Why not? The stretch was known to be dangerous. Nearly 80 passengers died near the spot in an earlier derailment in 1943. Absence of positive train control was also cited as a factor in the fatal 2013 crash of a Metro-North train in the Bronx. The chief problem, as with infrastructure generally, is a woeful lack of funds. Railroads are under a congressional mandate to install the positive train control system on passenger routes and major freight lines by the end of the year, but they are seeking an extension because of the cost and complexity of the work. In an article titled "Why You Can't Talk About the Amtrak Derailment Without Talking About Our Infrastructure Crisis," Aviva Shen observes that the Northeast Corridor is the busiest and most profitable rail route in the US. The line, which runs from Boston through New York City, Philadelphia, and Baltimore to Washington D.C. , is dealing with more riders now than ever. But Amtrak has been starved of the funds required to keep up with this increased demand. It faces a backlog of repairs on bridges and tunnels that date back to the beginning of the 20th century, obsolete rail interlockings, and trains that rely on 1930s-era components. Repairs for the Northeast Corridor are expected to require $4.3 billion in fiscal years 2015-2019, while federal funding is expected to dwindle to $872 million. But neither these exigencies nor the May 12th crash was enough to stop the Republican-led House Appropriations Committee from voting on May 13th, only one day after the tragic derailment, to reduce grants to Amtrak by $252 million, or about 15% from last year's level. The measure still needs to clear the full House and Senate before going into effect in October. While transportation infrastructure is short of funds across the board, Amtrak has been pinched more than most. Congress holds the agency to a unique standard by demanding that it turn a profit per passenger. This is not true for highways and airports, which receive about 45 times the subsidies that Amtrak does. Why the difference in treatment? Perhaps because of Amtrak's large and growing profit potential. Trains charge by the rider; roads do not. Republicans have long called for the privatization of the Northeast Corridor -- this despite the abject failure of the privatization of the British Rail System. In an editorial titled "How Two Billionaires Are Destroying High Speed Rail in America," Mike Vainisi observes that the push against public mass transit is being led by a think tank called the Reason Foundation, which is funded by the notorious Koch brothers.The Koch brothers' $44 billion fortune comes largely from Koch Industries, an oil and gas conglomerate.That means they have a vested interest in those gas-guzzling single-rider vehicles that are mass transit's competitors, the cars and trucks that use the roads that are heavily subsidized by the federal government. Congress's unique treatment of Amtrak parallels that of the U.S. Postal Service (USPS), for which privatization has also long been sought. The USPS was successfully self-funded throughout its long history, until it was pushed into insolvency by an onerous 2006 congressional mandate that it prefund healthcare for its workers 75 years into the future. No other entity, public or private, has the burden of funding generations of employees not yet born. The mandate appears so unreasonable as to raise suspicions that the nation's largest publicly-owned industry has been intentionally targeted for takedown, either because private competitors want the business or because private developers want the valuable postal properties. Privatization would similarly gut Amtrak's primary source of revenue and drive it into insolvency. The privatization proposal has never gained much traction outside conservative circles, but lawmakers have proposed massive cuts to Amtrak's budget virtually every chance they get. The push for cuts is part of the austerity meme of a Congress bent on "balancing the budget" at all costs. Conservatives are determined not to breach the artificially-imposed debt ceiling, which was hit once again in March. Congress again fixed the books by borrowing from federal pension funds and other creative accounting techniques. But the lid has largely been shut on new spending, even for such essential services as infrastructure. The major federal transportation fund will run out of money by the end of May, and a $478 billion transportation funding bill is facing an uphill battle. Even if it passes, it will be grossly inadequate to service the massive infrastructure needs of the country. According to the American Society of Civil Engineers, restoring US infrastructure will require an investment of $3.6 trillion by 2020. If the current level of spending continues, funds will fall short of that by $1.6 trillion. If Congress won't provide the money, who will? Infrastructure is the latest investment boom for private funds in search of safe, lucrative returns. Investors are particularly interested in the "plum" projects with significant profit potential. That would include Amtrak's Northeast Corridor and the US Postal Service. Infrastructure projects can yield decades of steady, cash-flow-heavy returns of up to 10 to 14 percent --"a return like a stock's with security like a bond's" -- and they are effectively guaranteed by the government. They are good for investors but not so good for governments. A rule of thumb is that borrowing to fund infrastructure doubles the cost. Besides loans, infrastructure opportunities attractive to investors include outright privatization -- the sale of public assets at fire sale prices to meet government budget constraints -- and Public Private Partnerships, which privatize gains while socializing losses, imposing long-term costs and risks on the public. If the Trans-Pacific Partnership passes, investors will be guaranteed their "expected profits" no matter what. The interests of capital will, finally and unconditionally, have trumped those of government and the people. Where did the Chinese find the money? About 40% comes from bonds issued by the Ministry of Railway, 10-20% comes from provincial and local governments, and the remaining 40-50% is provided by the national government through lending by state-owned banks and financial institutions. Like private banks, state-owned banks simply create money as credit on their books. The difference is that they return their profits to the government, and the loans can be rolled over indefinitely. In effect, the Chinese government just decides to do the work, issues Chinese currency to finance it, and pays Chinese workers to get it done. They should take advantage of this once-in-history opportunity to borrow more in order to invest in new industries and technologies, to restructure their economies and to retrain and educate their workforce at the post-graduate level. Rather than issuing money to bail out the largest multinational banks, the Federal Reserve could do a round of quantitative easing directed at developing US infrastructure, creating US jobs using US labor and materials. But Congress seems bent instead on creating an artificial debt crisis to justify the privatization of the nation's choicest public assets, opening them to exploitation by wealthy investors.